Rachel has just arrived at her child’s daycare after a stressful day of work. Her 5-year-old daughter Kyla immediately begins whining, “I can’t find my coat! Can you go get it for me?” Stressed, tired, and trying to avoid a meltdown in front of the other parents and teachers, Rachel rushes from room to room looking for it. When she finally hands Kyla the jacket, her daughter screams, “You carry it for me!” Rachel complies, all the while stuffing Kyla’s things into her backpack for her. “Are we ready to go?” Rachel asks with a sigh, only to hear, “Yes, but you forgot my lunchbox. It’s in the cubby.” With Kyla’s coat under her arm and her backpack over her shoulder, Rachel tucks the lunchbox under her chin, wondering how she became her child’s pack mule. Before you do any task for your child, stop and ask yourself: “Can my child be doing this right now instead of me?” You will most likely find that the answer is a resounding yes! 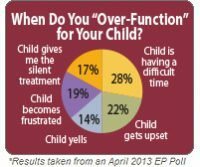 If this scenario sounds familiar, consider asking yourself these questions: Am I doing too much (or over-functioning) for my young child? Am I unintentionally teaching her how to be helpless? In this non-stop world of work, child-rearing, marriage and relationships, it’s easy for parents to move at breakneck speed without stopping to really think about what it is we are doing—or why we are doing it. So much of our lives now seems to move on auto-pilot: Wake up, get kids fed and off to school, go to work, (either at our jobs or within our homes), get the kids after school, go to the many activities they are involved in, make dinner, do homework, then prepare for bedtime. The next day we wake up and do it all over again. While this is just the reality for parents, the downside is that we often don’t take a moment to reflect on what each member of the family’s role is within this cycle of work, life, and home. As a result, many times parents find themselves in the habit of doing the same things over and over without thinking about what our kids can and should do—and this can mean doing too much (over-functioning) while our children do too little. How do you know if you’re doing too much for your child? The warning signs are there; we just don’t always see them. Below are some points to reflect on in order to see if you’re overworking yourself, while simultaneously (and unwittingly) letting your child off the hook too often. Is your child overly demanding? Oftentimes when a parent is doing too much for their child, they wind up with an overly-demanding, whiny child. Yes, all kids are demanding and whiny to a degree, but if you find that your child is constantly asking you for things and you are rushing to do them, you are probably over-functioning for him. Understand that he does this because he knows you will help him find the answer—and he won’t have to make the effort himself. Remember that your child is often perfectly capable of answering many of the questions they ask you. It may just take a little effort on their part and less input on yours. Does your child appear helpless and unable to complete tasks on their own? Okay, all kids (even two of my teen-agers) act helpless throughout their childhood because it’s natural for them to want to have things done for them. But if you find yourself constantly doing things for your child, such as hanging up their coat on a hook they can reach, putting away their shoes, clearing their plate, and finishing up their half-completed chores, you are doing too much for them. This is a slippery slope with your young child because believe me, soon they will be adolescents—a time when you want them to be taking responsibility for their actions and behaviors, not look to you to finish their tasks. While it may seem easier in the short run to do these things for your child, keep in mind that it’s their experience of completing such tasks, as small as they may seem at times, that are the key to taking responsibility for the big tasks that will confront them as teen-agers and adults. Does your child seem entitled? The issue of entitlement has come up over and over in the last few years among mental health workers, mostly because kids seem to have a sense that certain things are “owed” to them. If your child doesn’t take initiative to do things at home or help around the house, they may be heading in that direction. Many parents, out of guilt, exhaustion, or simply wanting to get the job done, take over for their kids instead of taking the time to explain the importance of completing a task. For parents of more difficult children, I understand that it can be easier to do the job than to spend 10 minutes arguing about it. The thing is, taking the easy way out isn’t always the best or most productive choice for our children. In the short run you may feel relief that the job is done, but in the long run, you’ve created a child who thinks he has no responsibilities and is entitled to a carefree home life. Change the current family dynamic: Your first step is to explain to your child (in an age-appropriate way) that being part of a family means pitching in. Too often parents make the mistake of thinking that younger children aren’t capable of playing a role in actively doing chores or being independent. In order to change your habit of doing too much for your child you must change the current way that your family does business. Children as young as three can begin doing things for themselves with the help of parents. Set expectations for your kids: Call a family meeting and begin by outlining (again, in an age-appropriate manner) what each adult in the house does during the day. Explain what your responsibilities are, and what you expect each child to do. Tell your child, “This is what we’re doing as a family,” then together outline what needs to get done in your house. Tell your child, “I go to work each day and do my job. The same thing is true at home—we all have a job to do.” If you stay home with your children, explain how much work you do in a day for your family and what is required to run a home. Keep it simple for younger children. Young children (ages 3-4) can begin picking up toys, putting DVD’s away, clearing their dishes, putting shoes away, or hanging up their back packs. Kids aged 5-7 can add on to that list by putting their dishes in the dishwasher, hanging up their coats, feeding the dog, and getting breakfast ready. Older kids can unload the dishwasher, sweep the floor, wipe counters, make beds, bring down laundry bags, and wash dishes. Make it fun: Keep in mind that if you make taking responsibility for themselves and learning how to get things done fun, your child may be more likely to buy into this new routine. Begin by creating a list of the chores and expectations you have for them and allow your child to pick several each day. In my house we wrote the name of a job on brightly colored index cards, then dealt them out like playing cards to each family member. Consider buying wooden nickels at your craft store and writing the names of chores on each one. Your child can pick out these “tokens” from a jar and those will be his or her responsibilities for the day. You can also play music, loud and fast, during “tidy time” to get kids moving. It can also be fun for young kids to race against a set timer to see how fast they can get the job done. The point here is that the onus of responsibility begins to move away from you and onto your child. How to answer your child: Many parents, tired and on auto-pilot, continue doing everything for their child without even realizing it simply by continuing to solve their child’s problems for them. Below are some examples of how to respond when trying to decrease the amount of work you are doing for your kids. Your child asks: “Can you find my new markers for me?” (while laying on the floor watching television). You get the point here. Every time you (probably without thinking, most days) fill in the blanks for your child you are doing too much for them. This sets up a pattern that may start out small (finding their shoes each time your forgetful child misplaces them) but can end up having a much more serious consequence (running forgotten homework to your son in high school for the umpteenth time). Realize that one of the best lessons we can give our children is to help them become independent, responsible young adults. You can start this by instilling a sense of independence and a work ethic now that will stay with them throughout their lives.